The 551 Inductor EQ is the only equalizer for the 500 Series actually designed by Rupert Neve. Featuring 3 bands of EQ inspired by Mr. Neve’s most prized vintage designs, along with custom-wound inductors, transformers and class-A gain blocks, the 551 brings the thick, powerful lows and sweet highs of Rupert’s classics to the 500-Series format for the very first time. The 3-band, custom-tapped inductor EQ on the 551 was inspired by RND’s favorite portions of Rupert’s vintage EQ designs. The low frequency band is designed to produce a creamy, resonant bass response – however, unlike the vintage modules that inspired it, the LF band on the 551 can be used as either a shelf or a peak filter, adding punch, dimension, and control to your low end. 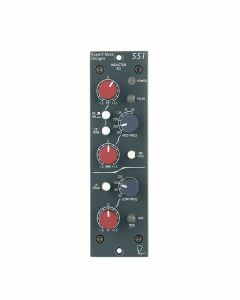 The 551’s inductor midrange band is ideal for sweetening vocals and instruments while bringing them forward in a mix, and its proportional “Q” response makes it well-suited for minimizing problematic frequencies. The high frequency band is a hybrid vintage / modern design, blending inductor circuitry with capacitor-based topologies to achieve vintage tones with enhanced control. The High Pass filter is a 12dB/octave design with a fixed 80Hz frequency, and can be used in tandem with the low frequency EQ to add low-end presence without clouding the source material. As Rupert originally intended with his most prized classic designs, each EQ section uses low-feedback, class-A discrete electronics to prevent low-level artifacts and harshness from detracting from the tonal shaping. However, this new circuit is a decidedly modern design with updated techniques and components that were simply not available 35 years ago, and should not be considered a “clone”. Both the high and low band can be switched from shelf to peak curves and offer 15 dB of boost or cut. The high band can be switched from 8 kHz to 16 kHz, and the low band can be selected at 35 Hz, 60 Hz, 100 Hz or 220 Hz. The inductor based Mid Band offers 6 center frequencies; 200 Hz, 350 Hz, 700 Hz, 1.5 kHz, 3 kHz and 6 kHz. The Mid Band also has a “Mid Hi Q” switch switch to narrow the bandwidth (increase the Q) of the filter. So, what are inductors? They’re wires wound around a coil that provide a form of frequency-dependant resistance. When they saturate, they bring out beautifully musical harmonics that give your tracks the smooth, polished sound that has made Rupert’s consoles and equipment so desirable for over fifty years. While it is possible to create a functioning EQ using off-the-shelf inductors, the attention to detail in controlling variables such as the winding and core materials in relation to the surrounding circuitry allows the 551 EQ to capture the vitality of Rupert’s older designs. While capacitor-based designs – like the 5033 – are often preferable for surgically sculpting tracks, the inductor EQ found in the 551 is capable of adding punch, vibrance, and personality to the source material that goes far beyond general frequency modification. With single-sided circuitry and transformer-balanced inputs and outputs, the 551 is capable of enhancing the sonic quality of many signal sources, especially those of digital origin. The sonic “signature” is one of extreme purity, and the image is consistent with that of Rupert Neve’s original designs of 35-40 years ago. This is an EQ with a truly vintage soul. Power and audio connectivity is supplied through any 500-Series compatible rack.